As a child in Poona (now called Pune to mollify the nationalists), my mother packed a “tiffin carrier” for my brother and myself with our school lunch. Our driver brought this to school arriving about half an hour before the lunch break and we grew up thinking that having a hot, home-cooked lunch every day at school was nothing out of the ordinary. A tiffin carrier was and still is a supremely practical way of carrying a meal consisting of a variety of dishes. The versions from my childhood were nearly always made of brass or stainless steel but modern versions come in a variety of materials. In the 1960’s I worked at a research establishment in the UK and we often worked 12 hour shifts when conducting programmes on prototype test equipment – generally for about a week or 10 days at a time. For a while I took to using a tiffin carrier to take my meals to work when on shift, much to the envy of my colleagues with their plastic boxes of sandwiches. The tiffin carrier with the variety of food it carries is naturally conducive to sharing food and that kind of sharing creates – I think – a social environment somewhat deeper than merely eating a meal together at a cafeteria. This account of using a tiffin carrier to school by Krishnamurthy Yenugu predates my experiences by just a few years. I find it incredibly nostalgic about a world long gone. But the tiffin carrier culture is still going strong in the work place – and long may it continue into the fast-food world. YK Antiques: This vintage brass 5-tier tiffin box was used by me during my school days to carry lunch to my school. I was born in the year 1940. My grandfather who was a head master for the only elementary school we had in our village Someswaram, in the East Godavari District of Andhra Pradesh, India, had admitted me into the school when I was five years old after doing proper pooja and ceremonial Akharabhyasam (writing OM first time on the slate). I started going to school along with my grandfather Sri Yenugu Krishna Murthy carrying a palaka and balapam (stone slate and stone pencil) in a cotton bag. This was all my school kit. I graduated from 5th standard when I was 10 years old and that was the maximum education my school could offer. The nearest high school was 5 kilometres away and the only way to reach there was by a bicycle. Since I was considered as too young to go alone on a bicycle, my grandfather decided I should stay with my uncle Sri Rajupanthlu garu in the town Peddapuram. I was admitted in the ULCM High School, Peddapuramin the 1st form (now equivalent of 6th standard) and I successfully completed my 3rd form when I was 13 years old. By then, I was considered eligible to ride a bicycle. So I was shifted back to our village Someswaram and got admitted in a high school in a village named Rayavaram about 5 kilometres from my village. I got a new cycle and a tiffin carrier with 5 boxes in the year 1953. I do not know if I got a brand new lunch box or an already old one by then. Let us consider that as new at that time. That brings us to the age of this 5-tier brass tiffin box set at 60 years old. This 13 inches tall lunch carrier has an assembly of five containers- a large one with 3 inches height, three medium sized ones with 2 inches height and a one small one (5th one) with one inch height. All the round boxes are 4.5 inches wide (diameter). All the five containers are held tight by a brass strap frame resembling an inverted “U”shape that has a bent at the top. The two parallel sections have grooves that fit snugly into the knobs on the lower container. The upper most box tightly fits into the bent part of the “U”. The top part of the “U” is used as a handle to carry the tiffin carrier assembly. There is an aluminium spoon that holds the boxes and the frame together. The brass frame has two holes at the bent, and the top vessel lid has a knob with one hole. When the frame is pushed on to the five container assembly, the two holes in the frame and the hole at the top box lid come in a single straight line and the aluminium spoon is inserted through the 3 holes. That seals the assembly tight. I used to start from home at 9 a.m. every day to school and my mother used to keep my lunch carrier, which she used to call it dabba, ready by the same time packed with hot food for my mid-day meal. She used to pack rice in the big dabba at the bottom, the second one with the pulusu or pappu, the third one with vegetable curry, the fourth one with curd and the top one with pickle. The pickle will be eitherAavakaya with badda ( mango slice) or Maagaya with juicy tenka (mango seed). I used to keep the hot brass tiffin box into a cotton bag with handles and hang the bag on the left side of the handle bar of the cycle. My school books were pushed into another similar bag and it was hung on the right side of the handlebar. This was how my journey to school started. If there was an item of interest, it was the carrier. My mind would always be on the carrier instead of on the class subject and I would wait impatiently for the lunch time bell. The children of our village used to sit together and eat our lunch and most of the times we used to share our lunch. Our school used to be at the far end of the village amidst paddy fields.There used to be small canals (bodikalva) to irrigate the paddy fields. We would sit on the banks of these canals under a mango tree and eat lunch with a picnic atmosphere. After that we would wash our tiffin carrier in the canals, reassemble them and put it back in the cotton bag. 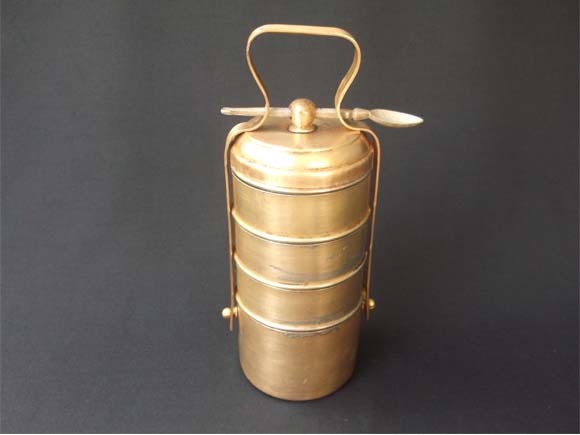 I was using this vintage brass lunch carrier for three years during my studies for 4th,5th forms and SSLC (Secondary School Leaving Certificate) which is equivalent to present day 10th. After my SSLC, I had gone to Kakinada to study my Intermediate in PR College. Thus, my cycle journey and my dear lunchbox carrier were given rest. While my cycle was disposed, I retained the brass lunch carrier, my companion for 3 years. It is now an integral part of my antiques collection. This fabulous 5-tier tiffin box is my goddess Annapoorna which fed me for three years in my life. This entry was posted on February 25, 2016 at 11:24 am and is filed under Behaviour. You can follow any responses to this entry through the RSS 2.0 feed. Both comments and pings are currently closed.